Offering you a complete choice of products which include automatic hydraulic bollard and automatic rising bollards. We are engaged in providing Semi-Auto Steel Bollard to our customers at reasonable prices. The offered Semi-Auto Steel Bollard is known for its quality. 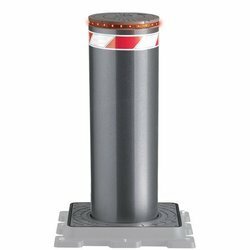 Semi-Auto Steel Bollard is extensively used in places such as various malls, offices, banks, institutions, etc. The offered products are durable in nature and easy to use. Electric-automatic bollard is normally used for public carport management and private yard access control. It can meet the demands of high frequency access control. 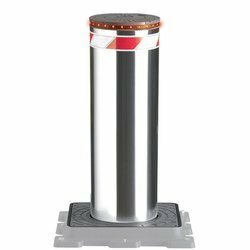 Delos electric-automatic bollard adopts the low voltage direct current machine with electronic brake as the power unit. It is safe and reliable with low power consumption, fast lifting speed, low noise, stable running as well as other advantages. Control the lifting of electric-automatic bollard by connecting with third part access control system (smart card, RFID, remote control and program control). You can choose ground sensor, buzzer, infrared anti-collision and other kinds of auxiliary devices according to system demand. The rise/fall time is 3-5 seconds, satisfying the access control demands of high frequency entrance/exit.